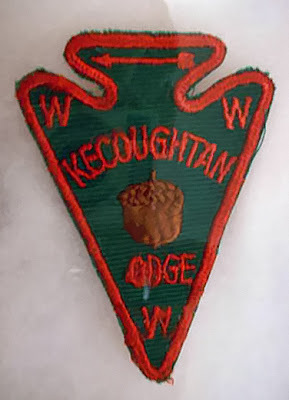 In October of 2006 an eBay auction featuring the original Kecoughtan A-1 arrowhead patch pattern from the manufacturer was won by Michael McCaughan, a Virginia OA collector and member of Blue Heron Lodge 349. Here is a picture of the A1 design, the A1 they retained as a sample, and a close up picture of the thread count (in case you were curious). 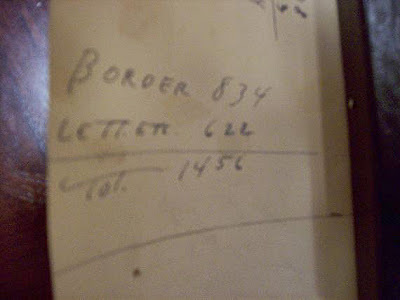 There is also what I think may be an order date (7/52) written in pencil on the top. Apparently all their stuff was in storage in a warehouse in Chicago and the entire warehouse was sold off and cleaned out. All the patches were rescued by one of the workers who recognized the patches as Boy Scout items from his own time there and took the lot of them and put them in a garage/storage unit. Periodically he's been picking his way through it and eBaying the Boy Scout stuff. The pictures above and below link to full-size images. 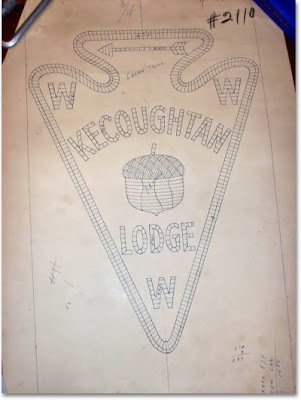 The pattern itself should definitely be viewed enlarged so that you can appreciate the fine hand-drawn details of the design that dates back over half a century ago, long before the age of computer aided design programs! Note that it was not unusual for a patch manufacturer to retain a slightly flawed patch in their files like the one above missing a letter, since the sample did not need to be perfect but the finished product delivered to the customer should be.